Razz is a pretty fun low ball card game, but I can’t believe people are trying to sell “spots” or “cards” like this. Just shows you the amateurs in this business. @Trade_Buy_Sell – Seems very defiant, I don’t trust this person. @CardFatherX – Seems very defiant, I don’t trust this person. *If you are on this list, instructions on how to get off are on the show. In Kansas, lotteries or “raffles” are illegal both by the statute and the Kansas Constitution (with the exception of the official state run lottery games). Under Kansas law, a “lottery” is defined as an enterprise in which a prize is awarded on the basis of chance for which consideration (usually money) is given. Nor may an organization sell an item, such as a pen (or baseball card) and “give” raffle ticket to those who purchase the pen. A Games of Chance license is required if an entity conducts games of chance in which prizes are awarded on the basis of a designated winning number(s), color(s), or symbol(s), determined by chance. Only organizations raising funds for the promotion of bona fide charitable, educational, scientific, health, religious, and patriotic causes can obtain a Games of Chance license. (b) “Gambling” includes a lottery and fringe gambling. (7) “Lottery” means any scheme for the disposal or distribution of property by chance among persons who have paid or promised to pay any valuable consideration for the chance of obtaining property, or portion of it, or for any share or any interest in property, upon any agreement, understanding, or expectation that it is to be distributed or disposed of by lot or chance, whether called a lottery, raffle, or gift enterprise, or by whatever name it is known. EVERY OTHER STATE HAS SIMILAR OR EVEN MORE STRICT LAWS REGARDING RAFFLES. ONLINE BREAKERS ARE NOT CONSIDERED A CHARITY OR NON PROFIT ORGANIZATION. @BreaksForFun – Appeared to probably only mentioned the word “Razz” in a tweet that wasn’t for an actual raffle he was running on his site. I apologize to Breaks For Fun, and hope mentioning him in this didn’t cause his business any harm. This is someone I have spoken (and have really enjoyed) talking to in the past. @AbstraktCollect – Another person I have spoken to in the past via e-mails or twitter and I think is probably legit. Admitted to doing these raffles, but said publicly that he would stop. Since this is someone I have talked to in the past and felt good about them, I have removed him from the above DO NOT BUY List earlier than if I hadn’t talked with him in the past. 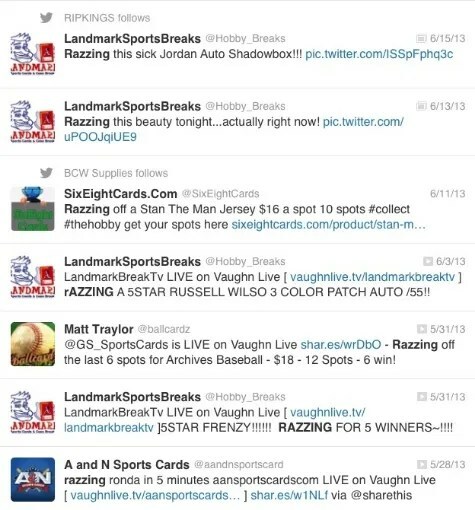 @FightHobby – Ran “everyone wins razz raffle” – and I believe sometimes hosted them for other collectors/fans. While an “everyone wins raffle” is probably even slightly more legit than selling box break slots, the use of the word “Razz” caused me to flag him in my DO NOT BUY LIST above. I don’t know this person, and have never spoken to him in the past. I probably have a slightly different opinion of “everyone wins razz raffles” but I would strongly consider trying to find an attorney that can give you some free (or low cost advice) on running these. If you are making a profit, it’s still similar to gambling or gaming where “everyone wins” – just some more than others. That all being said I still wouldn’t try processing those payments through PayPal. Below are some of @FightHobby’s comments on twitter, and just from what I read, seems to be very honest with his thoughts, so I took him off the list despite never talking to him, and the fact I have multiple people saying these were “everyone wins raffles” – and many came to the defense of @FightHobby both publicly and privately on twitter and e-mails. 2013 Donruss Elite Football is out on the 12th, which was pushed back from a Wednesday release. This marks the third pre-season NFL release from Panini. A few weeks ago they announced that there would be some boxes with extra hits to only pull that announcement off the table a few days later. Duplicate Bowman Football serial ## cards. A collector on Twitter sent me photos of. 2013 Bowman Joe Flacco Orange #1/50 and then sent me a link to another one on eBay #1/50. Oladipo looked pretty good for the Orlando Magic during the summer league but still needs to improve shooting % and turnovers. He also plays with high energy and instinct so I see why Orlando picked him. E-mail Question: long term value of cards and price movement for both vintage and modern cards. Does the autograph grade really effect the value of the card? How do you price graded cards? In person autograph – why don’t they get much respect.